Order now ColourVue mini sclera Green Goblin contacts from Optyk Rozmus and enjoy huge, vividly green eyes. 2 lenses per box. Green Goblin is one of the most famous Spiderman's enemies, but it is also the name of 17mm mini sclera contact lenses from ColourVue. 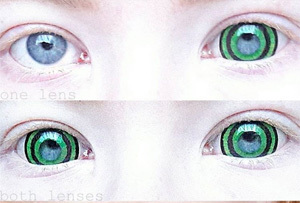 These large diameter, vividly green contact lenses feature a black line running around the iris and delicate lines beaming from the centre, which give them a three-dimensional look. Thanks to all those features, ColourVue Green Goblin contacts make a fantastic costume accessory, not only for Green Goblin costumes.